Follow our route from right to left starting at Marsh Bend Outlet Park (#1) and ending at the Gulf of Mexico (#6). The prediction was for really cold weather, possibly record breaking cold, overnight. So I put on everything I had, including the down jacket and crawled into my sleeping bag for what I thought might be an uncomfortable night. On the whole, it was not. Except for the tip of my nose, I was not cold. I was wakeful, in and out of sleep for much of the night. I got up once to relieve myself and checked the temperature. It was 2:30 AM. The air was perfectly still and the sky ablaze with stars. The temperature was 33 degrees. I awoke at 6:19 AM to see that the inside of my rainfly was frost covered from the cold and my respiration. It was 32 degrees in my tent, colder outside. 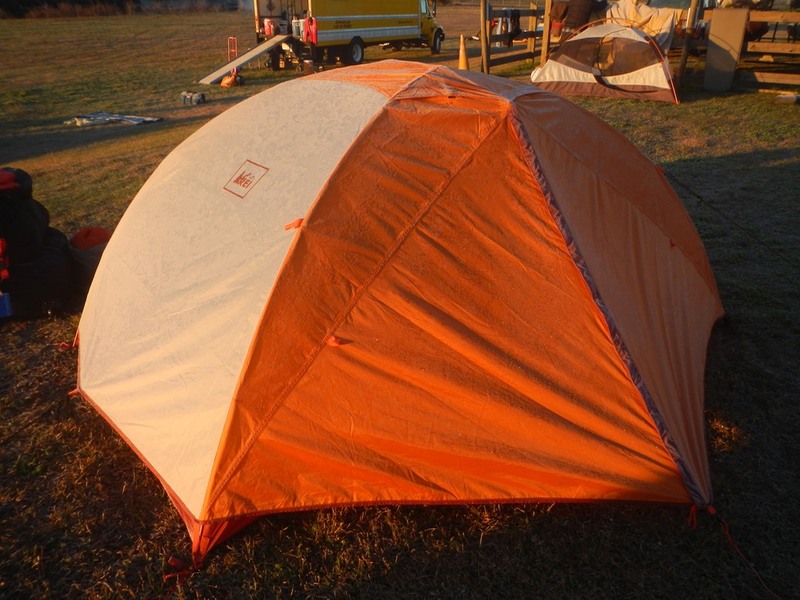 Not a record, but still plenty cold to be camping, especially in sunny Florida! I set about packing my gear. I had pondered through the night about what I would wear this morning to combat the cold and still be dressed appropriately for paddling. Fortunately I had packed my Farmer John wetsuit. I had brought this to practice self and assisted rescues with Jill Lingard. This never happened because the air had been so cold. But today, I put the wetsuit on over my long underwear, with a warm zip necked shirt over it and my paddling jacket and pants as an outer layer. My Sealskins socks had still been a little damp when I placed them in the vestibule area last night. This morning they were a bit stiff. So I sat on them while I packed my gear to thaw them out. The socks, water shoes and hat completed my outfit for the day. And I was neither cold nor too warm in it. 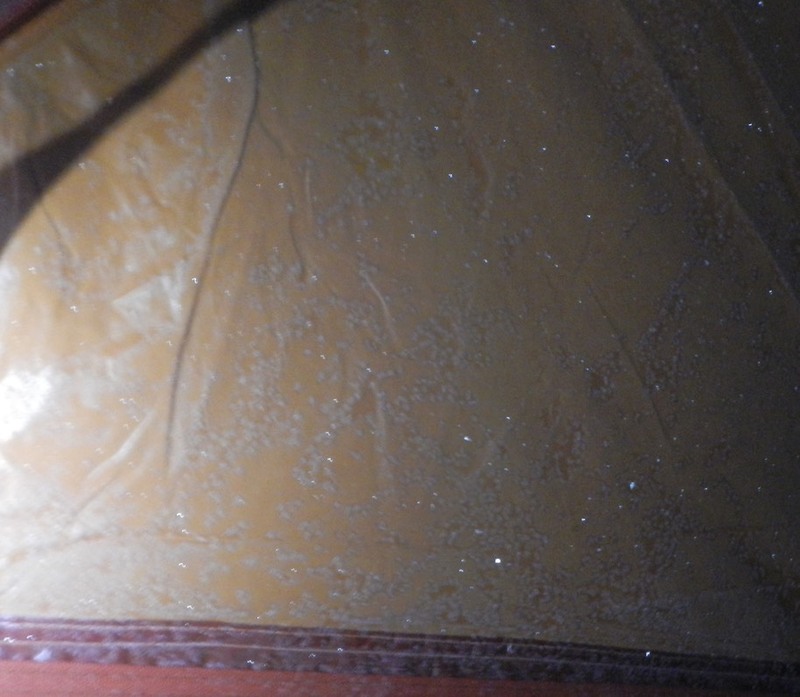 The outside of the tent was also covered with frost as was everything else I could see. Dropping the tent and handling the poles was a painful proposition. To continue our trip we had to portage around the dam and defunct lock. Fortunately our outfitter (Nathan Witt, owner of Rainbow River Canoe and Kayak, and also mayor of Dunnellon) had a shuttle arranged to do the heavy work. Soon we were on the water. We were given contradictory information about where our lunch stop would be. Would it be at seven miles or nine miles? It didn’t matter. We’d just look for the lunch flag that would mark the Yankeetown Women’s Club, our lunch venue. What no one had figured on was the speed of the current running in the river. I clocked a speed of 6.9 mph at one point. As a result, no lunch flag was out when we shot by much earlier than expected. We knew we must have missed the stop when Yankeetown faded into the distance behind us. The river above Yankeetown was relatively narrow and shaded which just added to the feeling of being cold. And its banks and broken down docks were littered with large boats decaying or decayed, left to rot in this small backwater, the discarded remnants of broken lives and dreams. It was depressing. But then there was Yankeetown, a pretty little Gulf fishing village. And beyond Yankeetown, the river opened up into a grassy, treeless flood plane with lots of windless sunshine and blue skies to warm us. It was only about four miles to our take out at Bird Creek Park on The Gulf of Mexico, so we continued on. 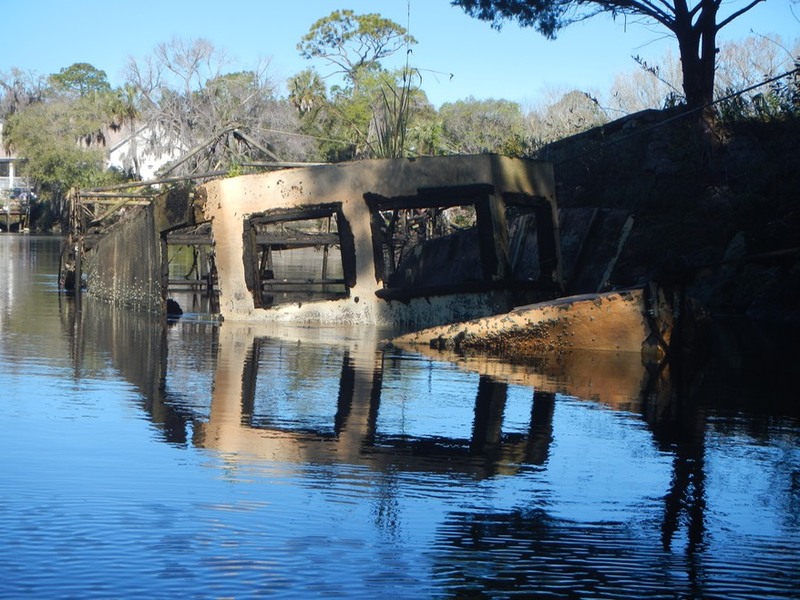 This video shows the last day of our Marsh Bend Outlet Park to the Gulf of Mexico and Bird Creek Park, down Florida's Withlacoochee River. The day was bright and sunny but very cold. It was also our shortest paddling day at less than ten miles. 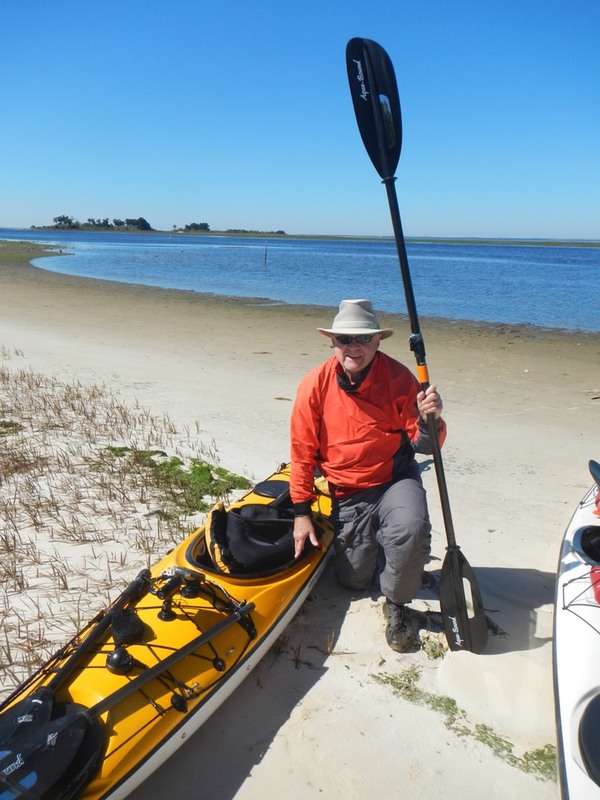 When we reached the park, Jan Corcoran was there with the lunch we missed in Yankeetown! Photo: On the beach at Bird Creek Park on the Gulf of Mexico.